Montessori. This word has had great meaning to a number of famous people including Lary Page & Sergey Brin: Founders of Google, Will Wright: Creator of “The Sims” video game, Sean “Puff Daddy” Combs: Music producer/entrepreneur, Jeff Bezo: Founder and CEO of Amazon.com, to name but a few. 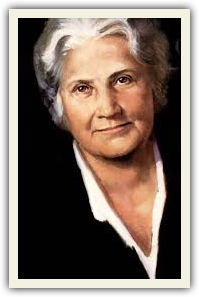 Maria Montessori, an Italian physician and educator, was responsible over 100 years ago, for the creation of an educational system based on individualized teaching, self-directed motivation, and self confident attitudes. Neglected children in the Europe of a century past were Dr Montessori’s inspiration. Hundreds of international children attending Montessori schools today are the realization of her dreams and hard work. To the forgotten children of Europe, Montessori meant an opportunity to environmentally adapt themselves. That is, Dr. Montessori’s dream was to better acquaint the children with everyday demands of living, such as stimulating their sensory appreciation, or, more practically, teaching them to tie their own shoes, dress themselves, add and subtract, and experience an unpressured learning situation. Ironically, these needs still exist. A too often neglectful modern pace of living on the part of adults, combined with overcrowded schools, have resulted in a loose approach to the education of America’s young people. An entire generation faces the stark realities of existence as ends in themselves, and our ability to touch and really feel, our capacity to reason instead of memorize, and our temptation to sit rather than stand, have long been suffering. The Montessori method of teaching, having taken a second look at generally accepted means of instruction, sets out to revitalize education and to make it something it is not often thought of, a pleasurable experience. Sensorial adeptness is developed by acquainting the child with sensory-stimulating elements of his environment. 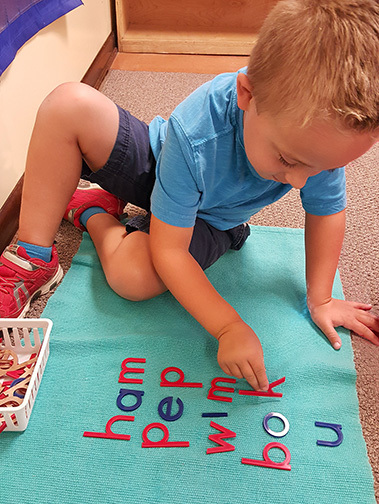 For example, a sensitive tactile response can be developed by exposing a child to varying textures of cloth and calling on him to distinguish between them. Practical life learning is based around physical experiences which require nonverbal reasoning and muscle coordination. Children are taught to tie, wash, polish, to button, and to pour, as well as perfecting body balance. The latter is achieved through the use of walking beams. The reading area uses the phonetic approach. The students begin this training by learning to match word cards with objects identified on the cards. They continue on through mastering sentence structure and finally, writing. Math instruction begins with distinguishing large and small objects, or realization of size differentiations. It progresses to an understanding of the concrete concept of a numeral. Golden bead squares and sand paper numbers make the child’s learning experience more tangible and memorable. Geography is a large part of the Montessori curriculum. In learning the meaning of various geographical land forms, such as islands, peninsulas, and continents, the students learn definitions by making small scale models. It wouldn’t be difficult to remember what an island was, if you had made one by placing a chunk of soil into a pan and then filling in around it with blue tinted water. 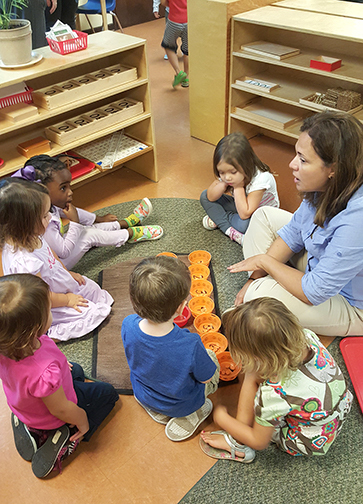 Emotionally, the Montessori school children are inspired to adopt positive attitudes. Their personal responsibility to behave properly is promoted by the theory that “you can work on anything you want to as long as you don’t bother anyone else”. Teachers instill positive attitudes toward discipline by never saying “don’t run” but rather, “walk quietly”. When students deviate from appropriate classroom behavior by fighting or failing to replace their equipment, the event is discussed by the class as a whole. Art work, puppet shows, field trips, current events, creative building, “show and tell”, and gardening are among the other class activities. Dr. Montessori felt that physical activities combined with the use of material objects helps the children to form abstract concepts which they may later use in problem solving. It is feasible that the Montessori teaching methods are worth their weight in gold for the influences they exert in self-directing young learners. For an un-coerced child to independently explore learning situations and to feel self respect for his efforts, whether or not they are successful, are two outstanding rewards of the Montessori system. Surely society will reap rewards of equal worth from the young people instructed in this manner. 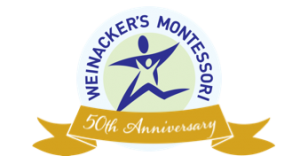 Montessori education offers something for every type of student. The slow learner is not pushed, the average student is challenged, and the child of exceptional abilities is allowed to move at his own speed. Competition is at a minimum and learning is made more enjoyable.